Ok, so today I remembered to put the SD card IN my camera! Whoo! There’s a thought. So I woke up late today, and had to run into Portland to get to Jasmin and the crew of the Knit More Girls Podcast. Despite the K word in the title of the podcast, these lovely ladies are cheerleaders for Croch-equality! Crochequity! and well all the fine stuff we are! So what did I get today? More Laurell Hill Hooks (cause I just knew I’d regret not doing it), and a skein of very pretty silk/linen yarn, and a fabo swift from Paradise Fibers, and some devil ducky stitch markers from our very own Craft Kitten’s friends! I also got some beautiful buttons and some camel/silk roving from Crown Mountain Farms! OOOH OOOH! And I won a door prize! How cool is that or what? I never win door prizes, and it was two beautiful skeins of handspun! I was so stoked! They came with a Cowardly Lion Doll! However the highlight of the day was doing a second “photo shoot” with CLF Member Mortaine, aka Stephanie of Handk…Heros! (Which is a bistitchural comic book btw and very freakin’ funny!) 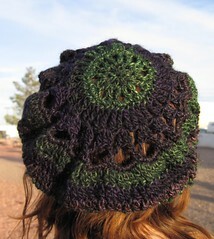 Check out more secret identity photos on the Handknit Hero’s website!